Weigela 'Red Prince' is a large shrub with medium oval to lance-shaped leaves, masses of pinky-red trumpet shaped, fragrant flowers. A very hardy plant, ideal for boundary or hedging schemes, but needs shelter from cold winds, and very hot or cold exposure. 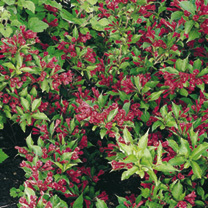 Useful as a town or city garden shrub. Can grow to a height of 3m, so prune to keep size and shape in check. RHS Award of Garden Merit winner. Flowering time: May-August. Height 2m (6'6"); spread 2m (6'6"). Supplied in a 2 litre pot. Ideal for beds and borders, patio pots and containers. Scented. Prefers full sun or partial shade.